In the last week of March 2012, the California Division of Land Advisors Organization closed the final portion of “The Bungalows at Beach House,” located in Port Hueneme, Ventura County. The Ventura County Team (Richard Byrd, Randy Coe and Michel Faris) represented the buyer and the seller in the sale of 29 “near finished” lots in the former John Laing Homes community. The Bungalows at Beach House originally consisted of 64 lots of which 35 have already been built and sold. The 29 subject 4,000 – 5,000 square foot lots sold to Standard Pacific Homes; the seller was a court appointed receiver. The Port Hueneme deal was a significant transaction in a wave of SEVEN land transactions that the California Division closed in the last week of the first quarter. 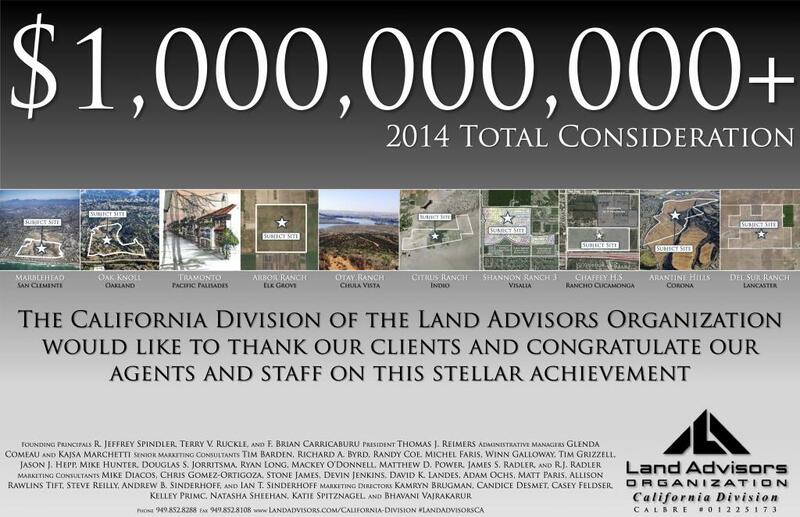 The number of transactions rushing to the finish line at the end of the first quarter may signal a broad-based upturn in the California land market, and the diverse characteristics and widespread geographic reach are exemplary of the California Division’s extensive residential land expertise. Source: Richard Byrd, Senior Marketing Consultant (626) 376-9840 ext. 13; and Michel Faris, Marketing Consultant (949) 852-8288 ext. 14. Land Advisors’ Ventura County Team (comprised of Michel Faris, Randy Coe, and Richard Byrd) are pleased to offer an exciting new listing in the Ventura County submarket. The new ±8-acre listing, known as Northbank Meadows is a rare multi-family development opportunity in the highly desirable yet extremely supply constrained City of Ventura. Historically, homes within Ventura County are highly sought after by homebuyers because of the County’s easy-going, high-quality beach lifestyle, in addition to its proximity to L.A. County job centers. Longstanding development constraints have kept Ventura County from over-development. Amid the slow growth, land values in the submarkets are holding steady and homebuilders and developers are taking another glance at opportunities in the area as the macroeconomic environment improves. Land development activity is still slow and sticky in Ventura County, as very few land deals have traded hands in the coastal county in recent months. Landed shared back on September 29th that home buyers are drawn to the region’s beachside lifestyle, but the County’s restrictions on new developments create a very supply constrained and difficult development environment for homebuilders. The same article reported that 458 multi-family units and only 116 single-family homes were permitted in Ventura County during the first nine months of 2011. Eighteen single-family home permits were issued in Ventura County in September, compared with two in August and 14 in September 2010. Those homes are being built in Fillmore, Oxnard, Ventura, Simi Valley and unincorporated areas. Oxnard leads Ventura County in housing starts with 337 year to date, which is by far the most in the County. Lenders served 1,535 notices of default in the third quarter in Ventura County, slightly down from the same period last year but up 35.3% from the second quarter. 669 homeowners in the County lost their houses or condominiums in the past three months. A total of 772 new, condominium and resale homes were sold in Ventura County in September, at a median price of $349,000. This price is down from $355,000 in August. Very few residential land REO’s are available for sale in Ventura County at this time. Most of the REO properties sold in 2009 and 2010, and now only four remain. Ventura County’s eight primary cities are desirable locations for homebuilders and developers. Home buyers are drawn to the region’s beachside lifestyle (good schools, safe cities, rolling hills and wide open spaces). However, the County’s restrictions on new developments create a very supply constrained environment for homebuilders. Many homebuilders and developers would love to find the right opportunity at the right price in the area. Now it’s a matter of finding available deals that pencil in the current economic environment.